Where’s the beef?? Well … it’s right here, at VonThun Farms! Our very own grass fed, pasture raised, all natural, hormone & antibiotic free, healthy, homegrown Aberdeen Angus beef. VonThun’s homegrown beef is now available a la carte, (view our current beef availability ) and as a Beef CSA Share. We hope you’ll put your faith in us and make us at VonThun Farms YOUR farmers this season. Where’s the beef? 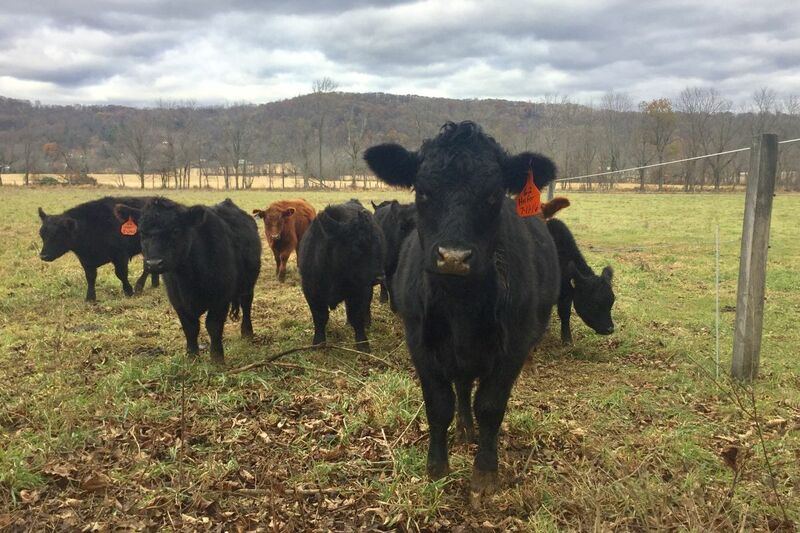 We hope that our beef will soon find it’s way from our pasture to your plate! Our beef is high quality Angus. Through our Aberdeen Angus breeding program we strive for consistency & superior carcass traits in our animals which in turn ensures well marbled, tender meat. Our beef is grass fed & pasture-raised. We do not confine our steers or finish them with corn. Our cows & steers spend their lifetime rotationally grazing our lush grass pastures the way they nature intended. Throughout the winter our cattle receive supplemental homegrown hay as they continue to browse and roam the pastures. Our animals are treated humanely in a low stress environment and are genuinely happy animals. Our beef is all natural. We do not use antibiotics or hormones for growth in our animals. Our animals are raised in a sustainable environment. All the nutrients from the manure are left to be recycled back into the soil, as our cattle fertilize the pastures as they graze. Our beef is fresh. Our animals are brought directly from the farm to the butcher, who dry ages the meat. While at the butcher, our beef carcasses are hung to dry-age & achieve the best flavor and tenderness.